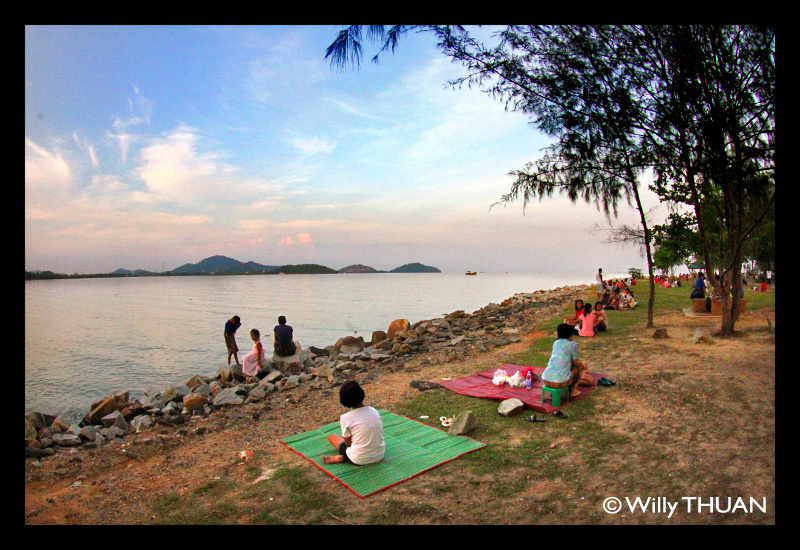 At first sight, Saphan Hin in Phuket Town doesn’t look like much during the day… a dull looking rectangular lake, a waterfront with not much to look at except for a sunken boat, a huge empty parking, and a massive abandoned shopping mall once called ‘Lucky Plaza’. 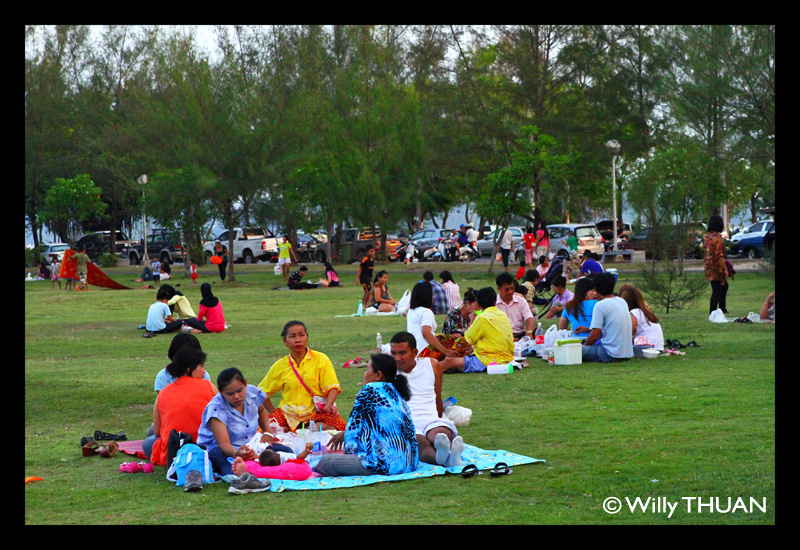 Now come again around 6 pm and you will feel transported in a city public park with hundred families, bunch of friends and couples picnicking on the lawn along the seaboard. 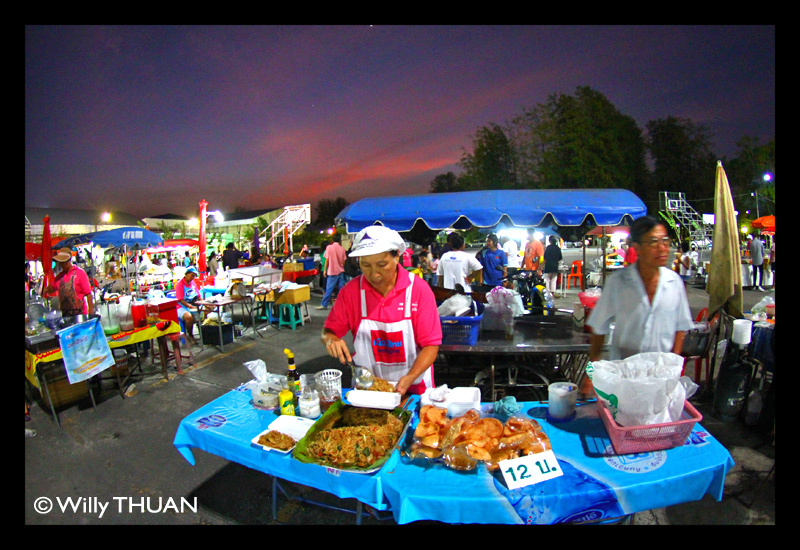 And in Thailand, where there is a crowd, there is food! 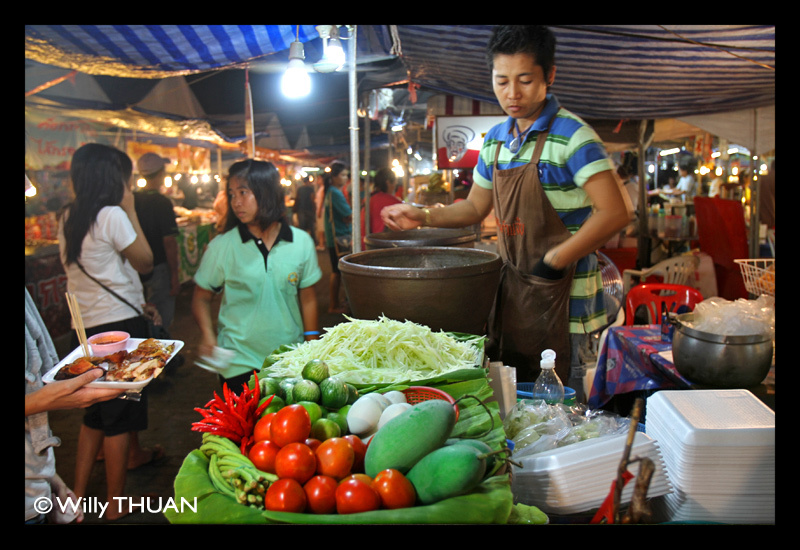 Food carts in Saphan Hin sell everything you need for an easy going evening by the sea, the unavoidable chicken barbecued, Som Tam (green papaya salad), mountains of fried noodles and all the meat sausages and balls you can think about. 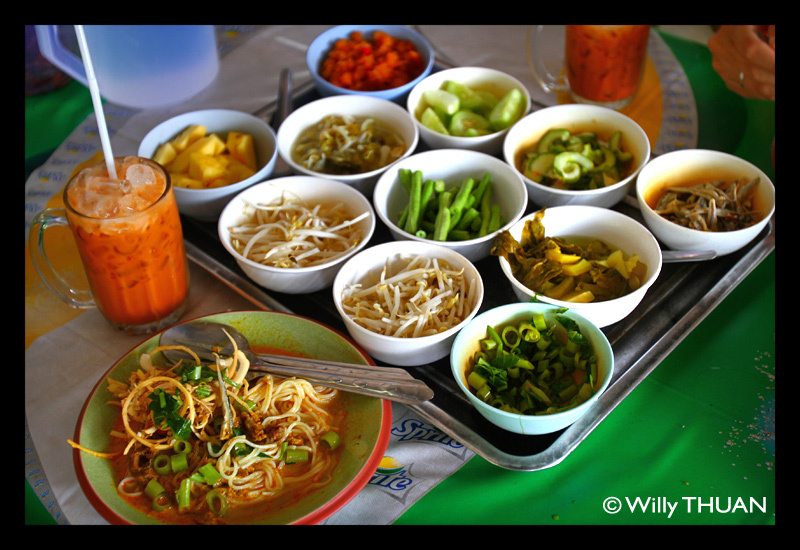 If you are in a sweet mood, try some of the colorful extra sweet drinks the way they like it here, or maybe some ‘Chao Kuay’ black jelly drinks that tastes like liquorice. Or a cup of shaved ice with syrup, corn and red beans (yes!). 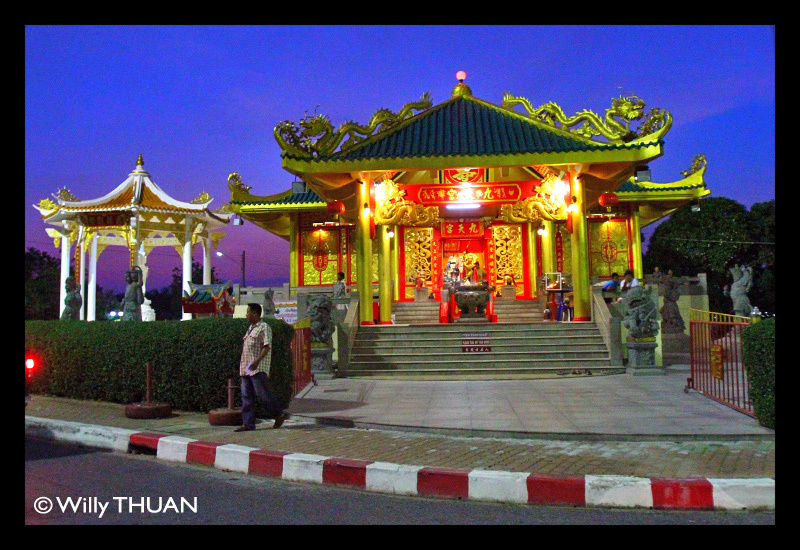 But best of all what always attracts the travellers, the fried insects!The Sapan Hin Chinese shrine named ‘Giew Tian Geng’ is also very active at the end of the day and looks beautiful with its lighting in the sunset colors. 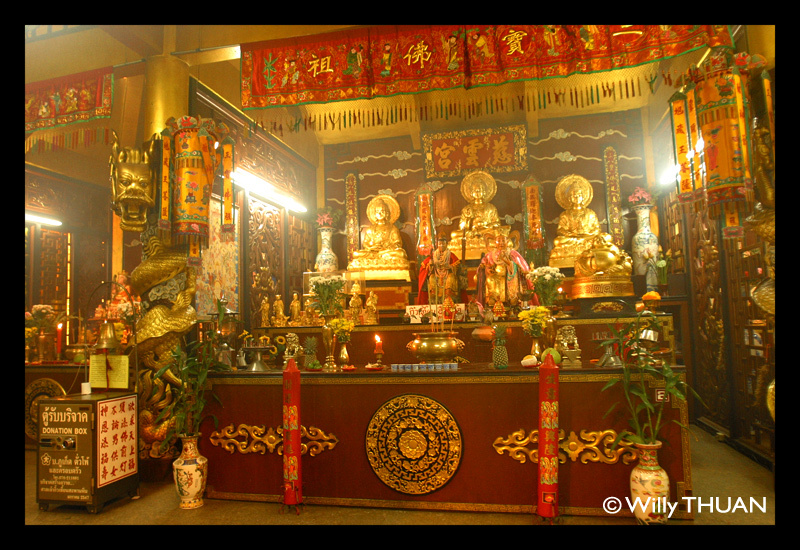 This shrine is one of the important temples during the Vegetarian Festival, but to many other small events al through the year so you might get lucky as I did.The huge parking you saw empty earlier hosts often very large events with a massive stage where shows or live bands perform, often loudly. 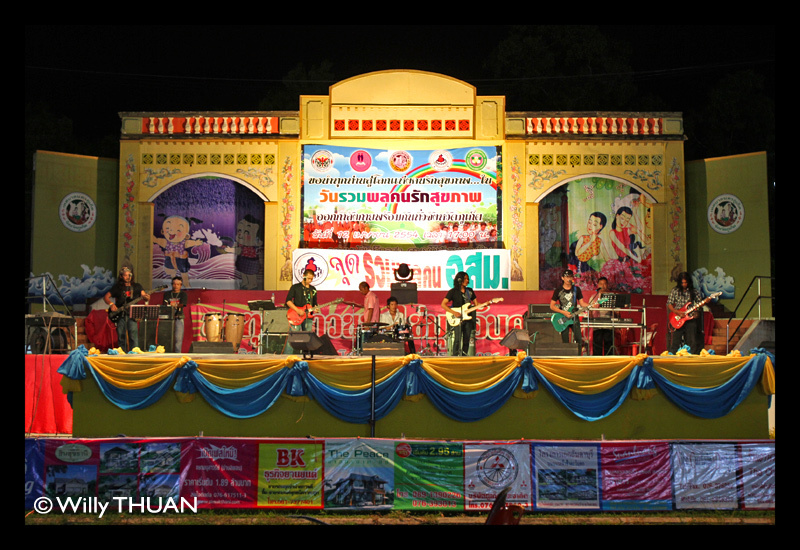 The markets or fun fairs are a good mix of ‘things to buy’, ‘things to eat’, and ‘things to play’ with all these silly but fun games Thai people seem to affectionate. 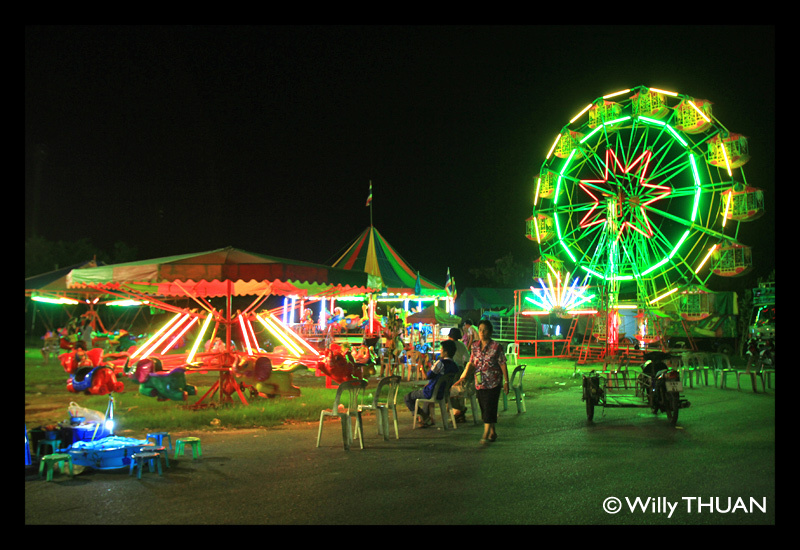 Across the road from this parking is a permanent mini fun fair with an inflatable castle and some tiny ferries wheel.Once a year, the Saphan Hin lake attracts huge crowds of locals for the Loy Krathong Festival, when everyone releases small floats made of banana leaves decorated with flowers, incense and a candles. On that day, it seems that the whole Phuket town has come and finding a parking is almost out of question. 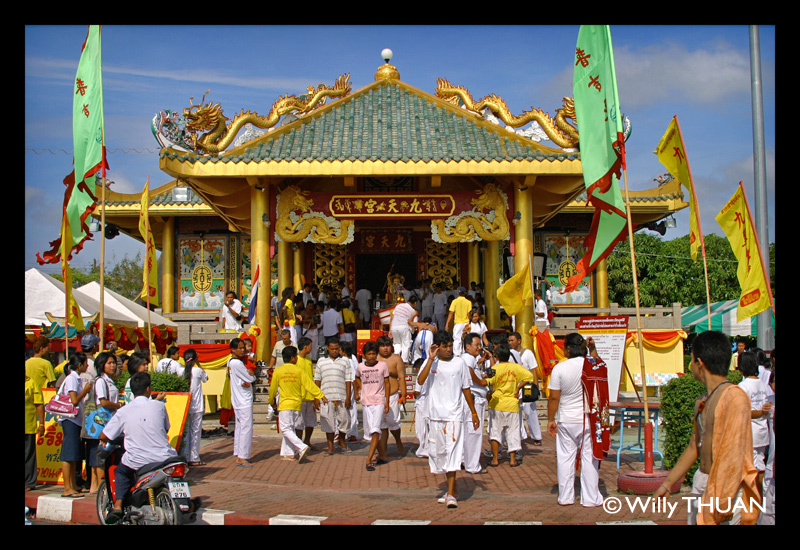 Songkran is also one of those days where crowds battle all day and a good part of the night near every water point they can find.The large abandoned building unwisely called ‘Lucky Plaza’ was for a short time a local shopping mall. Strategically, it seemed to be a good spot with so many visitors coming every evening, but maybe the choice of name was bad omen and it didn’t last long. 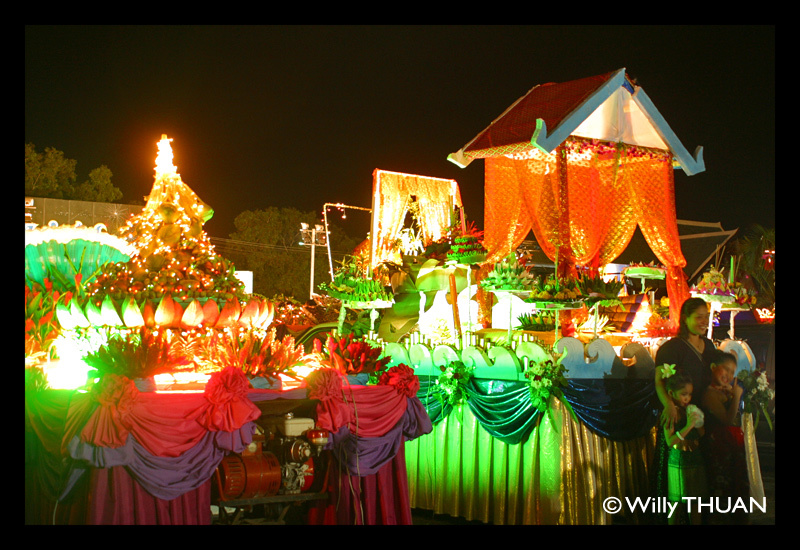 Ironically, the dozen of food carts stationed every evening in front of it seem to be rather successful. 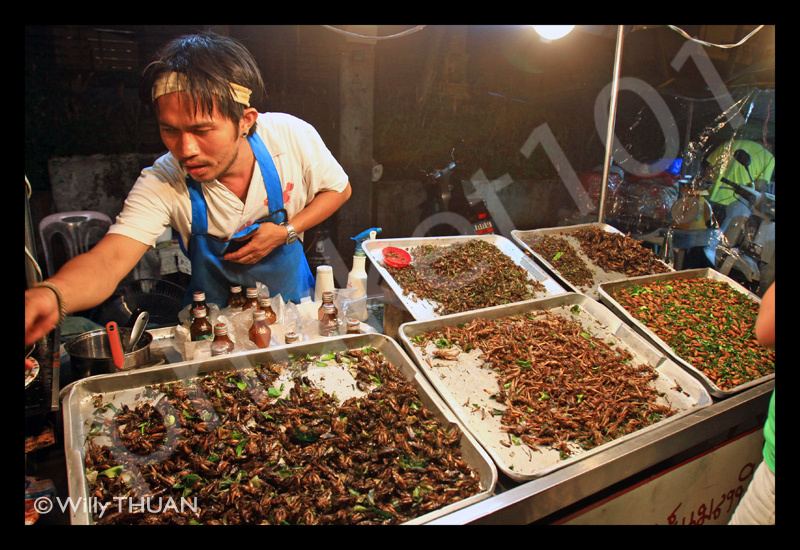 This is where you will find Khun Burm, the only ‘permanent’ fried insect vendor on the island. 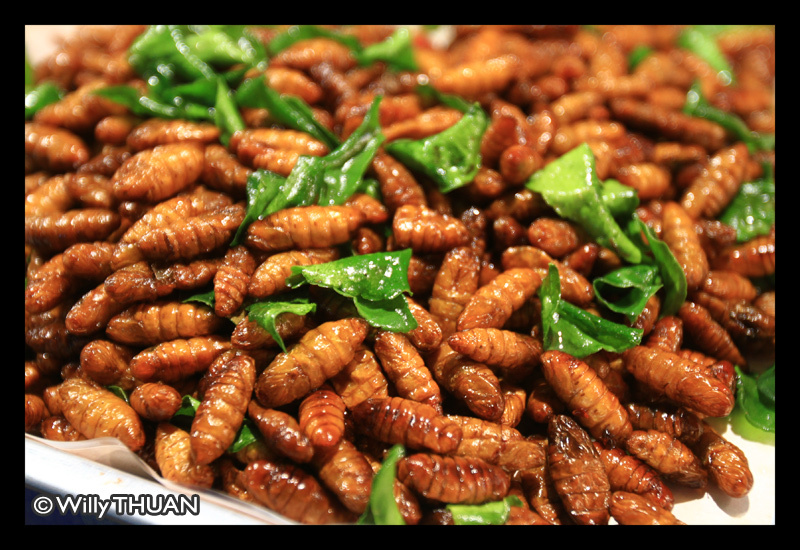 Of course I tried them all and if you want to know how they taste like, read ‘10 Insects for Gourmets‘! 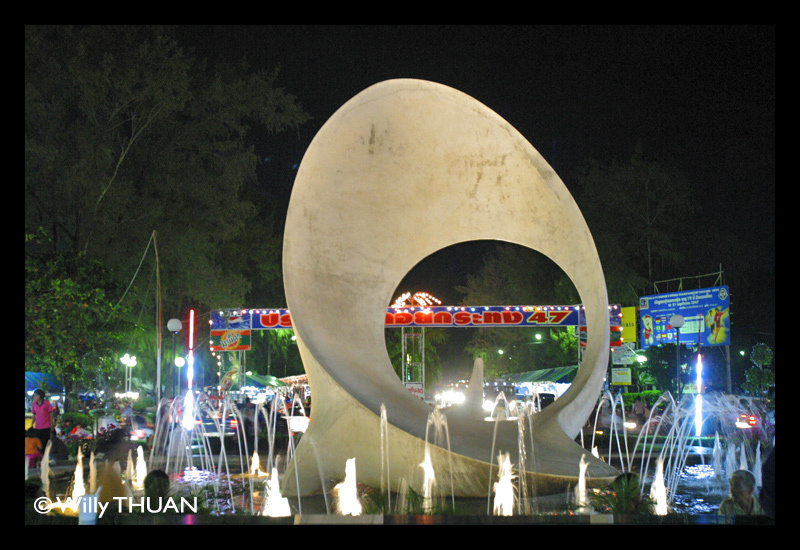 Two restaurants in Saphan Hin are worth mentioning, Phuket Seafood and a great Kanom Jeen restaurant called… Kanom Jeen Sapan Hin, how creative. Open all day from 10 am to 10 pm, this is where we would go if ‘Pa Mai’, our favorite place on Dibuk road is already closed. 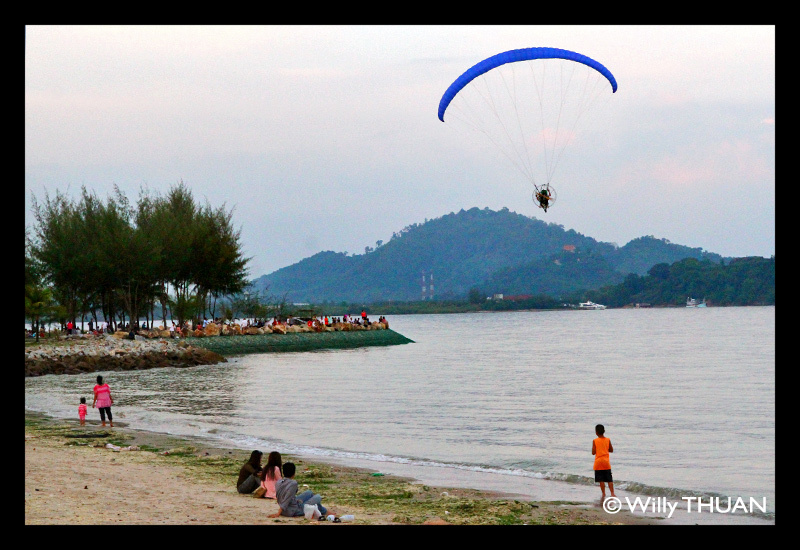 Saphan Hin is not an attraction worth adding to your Top 10 to See and Do in Phuket, but if you stay long enough and want to get in touch with the leisurely local life, go the after sunset and try the food! It’s fun and tastes often as good as in a restaurant!